Strange things can happen when you take a quick visit to the United States Mint. That was brought home forcefully a while back when an impromptu visit to the main Mint in Philadelphia was met with two major disappointments: the Mint building was closed to casual visitors without a pre-approved request to visit, and the grab bags are no more. Let me explain. In the post- 9/11 desire to be as secure as possible, someone in the United States government fears terrorists will blast Lincoln cents all over downtown Philadelphia, and has thus ensured that police were constantly patrolling all entranceways to the Mint, and that those large, ugly concrete barriers are in place near the doorways. The folks in uniform are actually rather friendly though, and while they can’t let you just stroll in any longer, they don’t mind if you try to speak with the woman running the gift shop. That process is a little bit odd, in that it entails knocking on a locked door and asking through the window for any specific items you might want. There is no “menu,” and of course, at the time you couldn’t actually go in without that pre-approved invitation or ticket. But again, the person running the gift shop was actually very friendly, and willing to look for any specific item that was requested. Alas though, she had to say that the grab bags were no more. Now the grab bags were little, cloth bags filled with an assortment of medals that only cost $20. They used to be one of the truly fun treats of the Mint. You picked one up, clanked it around in your hand for a moment, got the heft of it, then bought the whole thing without a clue as to what was inside it. For $20, it was usually a good deal. There might be a few medals in it that made you say, “who cares?”, but there was almost always one that made you smile. Such was the case with a grab bag that yielded up a Horn medal. All this may seem like a strange warm up to one specific medal, but this has a Michigan twist to it. The Horn medal that popped out of that Philadelphia Mint grab bag not too many years ago is one that qualifies as a testament to a largely forgotten Michigan hero. The Horn medal was made to honor Mr. John Horn, Jr., a resident of Detroit in the late 1800’s. The medal that Mr. Horn received was authorized by Congress, and was made of gold. Those available over a century later in Mint grab bags are made of bronze, but are probably no less attractive than the original, at least to an avid collector. 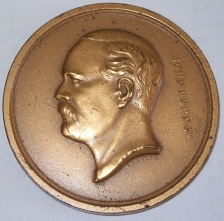 The obverse of the medal is elegantly simple, in that it sports a bust of Mr. Horn with the words “John Horn, Jr.” behind the bust, written from top to bottom. 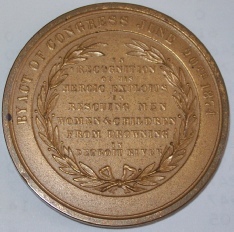 The reverse design is a laurel wreath enclosing the words “In recognition of his heroic exploits in rescuing men, women & children from drowning in Detroit River.” Outside the wreath the medal states, “By act of Congress June 20th, 1874.” The design is the work of Mr. Charles Barber. That’s about it. Now, on the surface, this might seem like a rather plain medal. What makes it fascinating though is Mr. Horn’s own testimony about his doings when compared to the medal’s proclamation of “heroic exploits.” The gold medal was awarded to Mr. Horn by an act of Congress, as the medal states, “in recognition and in commemoration of his heroic and humane exploits in rescuing men, women and children from drowning in the Detroit River.” That’s what the record reads. But Mr. Horn’s own letter to his Congressman plays down his exploits in some pretty kind, yet strong, language. He wrote that he has, “never desired a public statement of the service which, under God, I have been able to render in saving human life...” He goes on to give several examples of rescues he affected, with most of them also toning down any heroism on his part. For example, he further states in his letter that April 11th, 1866 was one of his worst nights, when he tried to rescue 16 men of which, “I rescued nine, and then became so exhausted that I could not swim, and had to abandon them to their fate. I got a very bad cold and lay in bed two weeks...” Now, let’s think about that a minute -- anything that lays you out for two weeks after swimming in the Detroit River in April is probably pneumonia! Assuming Mr. Horn’s writing was genuine, and not a whopping case of false modesty, it does seem that Detroit in the late 1800’s had a hero worthy of a gold medal. Like most Congressionally authorized medals, smaller, bronze versions were made available to the public, at least for a limited time. The bronze medal is 2” in diameter, and 1/4” thick. It is struck as a high relief piece, with Mr. Horn’s bust clearly visible above the rim if the medal is viewed from the side. It’s perhaps a bit surprising that bronze versions of this item are still available (or were a few years ago when the grab bags were sold) even 130 years after the commemoration of Mr. Horn’s deeds. So much for the term, “limited time,” when you hear that you need to buy an item now, as it is only available for a “limited time.” Apparently, enough were minted that some back room or hidden vault in the Mint still had a small stash of them. With the new restrictions on visiting the Mint, it might be wise to call or e-mail ahead of time to set up an appointment at the gift shop, or for a full tour, although the word is that those restrictions are slowly being lifted. The people there -- the police, the guards, and the gift shop folk -- are friendly enough, but they have to follow the rules. They don’t make them. You might still get lucky though, if you choose to ask for your own copy of Mr. Horn’s medal. You might be able to bring a bit of Michigan’s numismatic history back from Philadelphia.